How do I point my mail to G Suite? G Suite is a service from Google providing independently customizable versions of several Google products under a custom domain name. Make sure that your G Suite account is already established. Learn more here. If you want to use Media Temple's "Point Mail to Google" tool, the domain you want to use for G Suite must be using nameservers. Any changes to your domain's DNS zone file will need to propagate across the Internet. As a general rule, we recommend you allow 24-48 hours for DNS propagation. Read this article on how to lower your TTL value for a smooth transition. From the Overview page or Domains tab, select the domain you want to point to G Suite. 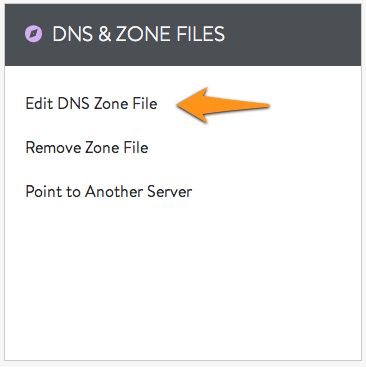 Scroll down to the DNS & ZONE FILES section. Click Edit DNS Zone File. Scroll down and click on the Point Mail to Google button. This action will point the email for the zone gs-example.com to Google. Please make sure that you have completed the setup through Google before proceeding. The page will refresh and your Zone File's MX records will now be pointing to G Suite. This includes an SPF record for your domain. You may also want to create CNAME records for your domain to point to G Suite.